Sunderland and Derby County kick start their Championship campaign on Friday night when they meet at the Stadium of Light. 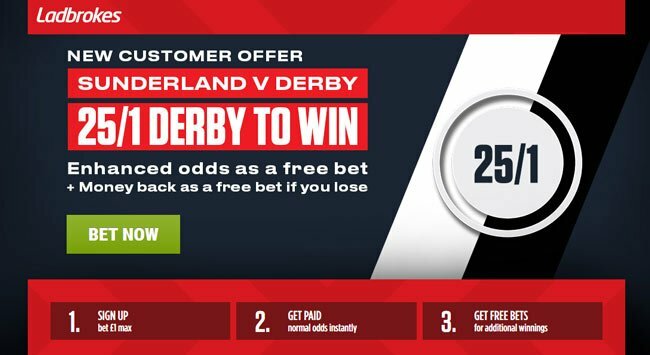 Read here our Sunderland v Derby betting preview with predictions, betting tips, starting lineups, team news, enhanced odds, exclusive bonuses and no deposit free bets on the new football season! Sunderland will want to forget last year after they finished rock bottom in the Premier League. They suffered 26 league losses and eventually finished 16 points adrift of safety. The Black Cats have had a tough pre-season as they recorded just three wins in the eight friendlies under new manager Simon Grayson and enter this match on the back of a 5-0 defeat against Celtic. Over the past six seasons, relegated clubs have returned just W6-D3-L9 in their curtain-raising clash. Sunderland begin life without the bnow departed Jermaine Defoe, who grabbed 15 of the 29 goals scored last season. Goalkeeper Jordan Pickford joined Everton, another keeper Vito Mannone also left for reading as well as Fabio Borini (AC Milan) and Victor Anichebe (Beijing). Key additions include Aiden McGeady, James Vaughan and Lewis Grabban. Furthermore, Jeremain Lens is rumoured to move to Besiktas. Bryan Oviedo has a calf problem but Jack Rodwell is back in training and Wahbi Khazri is expected to be fit. Derby have always flirted with promotion last season but their inconsistency cost them a lot. They had a W4-D3-L2 under Gary Rowett last term as they changed four different managers under impatient owner Mel Morris. Anyway, the Rams come into this match the more settled of the two sides. They enjoyed wins over Macclesfield, Port Vale and Kaiserslautern in pre-season friendlies, however these were followed by defeats to Northampton (1-0) and Hoffenheim (1-2). Gary Rowett will not t be much happy as he lost a few key players in the summer. Tom Ince joined newly-promoted Huddersfield while Will Hughes joined Watford. Anyway, the Rams have signed experienced players such as midfielder Tom Huddlestone, and centre-backs Curtis Davies and Andre Wisdom. Chris Martin has returned from a loan spell with Fulham and is expected to lead the line while Darren Bent suffered a hamstring injury in a pre-season friendly which is likely to keep him out until Christmas. The likes of Max Lowe, Jason Shackell and George Thorne are also sidelined. "Sunderland v Derby predictions, betting tips, lineups, live stream and free bets (Championship - 4.8.2017)"